Bonded pair found themselves as orphans at ten-years-old after their owner passed away. Ren and Stimpy came to Sarama after their owner died. Unfortunately there wasn’t a family member or a friend who could take them and they needed rescue. 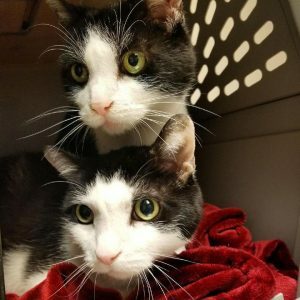 They are a seniors and very bonded and we knew the chances of them getting adopted at all never mind together from the local shelter were very slim. We were full at the time, but luckily one of our amazing foster homes made room for them both. They were in foster for a few months when both boys fell ill, one right after the other. After long hospital stays and many diagnostic tests we learned Stimpy has heart disease and Ren has liver disease. Both cats are happy and kept comfortable with their daily medications and special foods. But because of their age, how bonded they are and the expense of their vet care, we knew their chances of adoption were slim. So we decided to make them our first sanctuary cats. They will remain in their foster home being cared for by their foster family for the duration of their lives. Their foster parents, Cynthia and Michael, take extraordinary care of them, monitoring their health and making sure their daily meds are taken. Their foster dad Michael, says they are two of the sweetest boys he has ever had the pleasure of knowing. They are extremely bonded to each other but have also formed relationships with the other animals in the home. Both cats had a bizarre love for water. Stimpy particularly likes to get himself wet by jumping in the shower after its been used. He also likes to “cat yodel”. He goes into the most resonant reverberated portion of the stairwell late at night and sings. Ren is an explorer and likes to climb counters late at night and check out everything hes not allowed to see when his foster parents are watching. Michael shrugs it off though and says, “Cats will be cats. We are happy they feel so liberated.” And that’s what its all about. 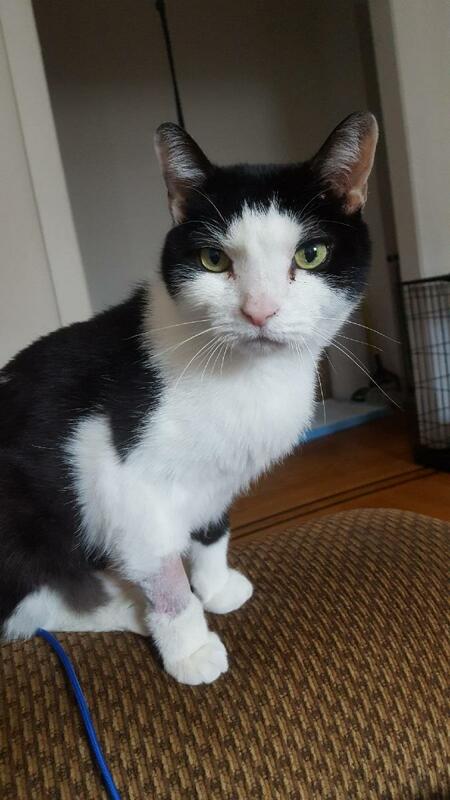 Big thank you to Michael and Cynthia for taking such amazing care of Ren and Stimpy and giving them a loving home to spend their elder years.